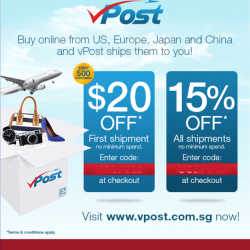 Shop for your favourite brands overseas with vPost! Exclusively for Citibank cardmembers, save up to $20 off your shipment now! Enjoy and get up to 20% off all air shipments through vPOST, no minimum spend required! Enter promo code UOB20A at checkout.so hurry grab Yours today! Ship the brands you love with vPost! Get S$20 off shipping charges + 5% cash back for all shipments with Min. spend of S$80. 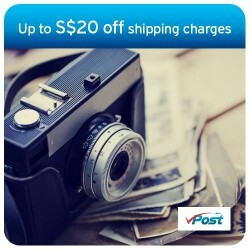 Or S$10 Fixed Rate Shipping + 5% cash back for new vPost customers. 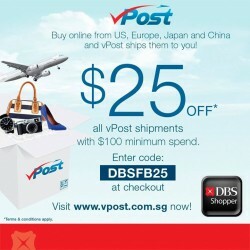 Let your fingers do the shopping with vPost and receive S$20 off your 1st air shipment!. Valid till 31 July 2015, with minimum spend of S$40. Enter promo code UOB2040 at checkout. Save more when you ship with vPost: Get 20% off shipping charges + 5% cash back for all shipments or $20 off shipping charges + 5% cash back for new to vPost customers with min. spend of $40. Now till 30 April 2015. Shop and ship with vPost with your Citibank Credit Card and get up to 50% off shipping chargers! $20 off shipping + 5% cash back for new to vPost customers and 20% off shipping + 5% cash back for all shipments. Take up to 50% off your shipping charges this Valentine’s Day until 30th April 2015. BIGGER BLACK FRIDAY SAVINGS: Get ready to ship your Black Friday online shopping spree home this weekend. 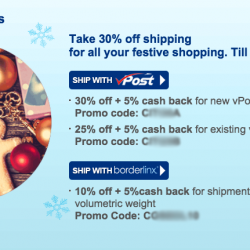 Enjoy 30% Shipping Discounts + 5% Cash Back with vPost when you charge to your Citibank Credit Cards from 27 Nov – 14 Dec.
30% off + 5% cash back with vPost - code="CITI30B"
10% off + 5% cash back with borderlinx - code="CGSBDL10"
Go on a shopping frenzy this festive season with Citi Globeshopper! Get the latest coupon code to for vPost or Borderlinx here! Up to 30% Shipping Discounts + 5% Cash back with vPost. 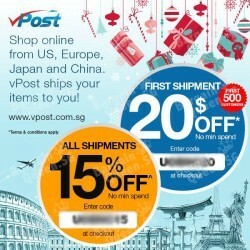 Here’s a festive treat for you from vPost: Get S$20 off your first shipment, and 15% off all subsequent shipments when you use UOB Cards! Start your holiday shopping now! Valid till 31 Dec 2014. Get $25 off with a min. spend of $100 at over 400,000 overseas websites with vPost! Enter Click to show coupon at checkout. Calling all CitiBank card holders! Last 4 days to get 30% off your first shipment with vPost. Promotion is exclusively for Citibank Credit Cardmembers. Use promo code Click to show coupon . Shop USA/Japan/Europe/China this Christmas at vPost with a bounty of great deals from over 400,000 global websites, including Amazon, Carters, Gap, Ralph Lauren and more! Enjoy up to 15% off with the code Click to show coupon at checkout with no min.spend Exclusively for UOB Cardmembers. Get $20 off your first shipment with the code Click to show coupon for the first 500 Cardmembers. Citibank Card members, enjoy 30% off your first shipment with vPost. Exclusively for Citibank Credit Cardmembers. T&Cs apply.